Hi all and welcome to SHBC! My name is Poppy and I am a third year classicist. As President of St Hugh’s Boat Club I am responsible for overseeing all that goes on under the club’s roof and offering help and assistance wherever I can. My first water-based passion was actually surfboat rowing which I started at the age of fifteen in my hometown of Falmouth. Whilst some may giggle softly behind their hands at “ocean rowing”, it certainly sparked my interest and I signed up for SHBC during Freshers’ Week of my first year. Since then I have rowed in both Oxford and external regattas, acted as Social Secretary and Women’s Captain, and become a cox. If you ever have any questions please do get in contact. My door is always open and my tin full of cake! 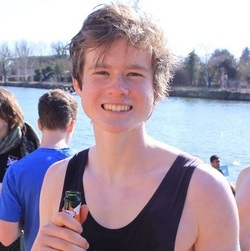 A new addition to the boat club, Sam is a fresher studying Arch and Anth. He joined SHBC during his first term and rows for M1. He is your main port of call when it comes to all things safety related. He also holds down the position of men's captain alongside Jamie so is always super busy! Hi, we're Nikki and Emma, and we're the women's captains. We both started rowing when we first came to Oxford, Nikki as a fresher, but Emma as an ancient third year DPhil student. We look after the women's squad as well as we can to get the best from you guys, organising outings and land training, sorting crews for competition, and just being around for you to ask questions. The women's squad has been very successful in the last couple of years, but we couldn't do it without the enthusiasm of the rest of the squad, at all levels of ability and experience! As men’s captain it is our responsibility to make sure that the men’s side of the boat club perform as well as possible. 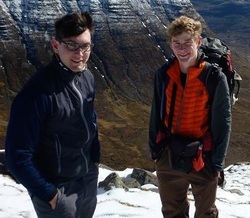 Jamie is a second year historian who formerly held the position of social secretary. Sam has the added pressure currently of also holding down the role of vice president for the boat club (he's super keen). We'll be working closely with the coach to ensure the men’s rowing team is as strong as possible. 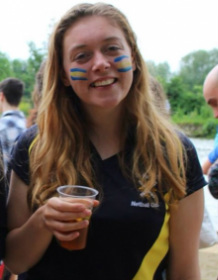 Hi, it's my job to recruit and look after the interests of coxes, and to communicate any issues that they may have with both the committee and the rowing captains, while ensuring that crew selection for coxes is done fairly. It is also my job to check that the boat club's equipment is well maintained. If you are interested in coxing with St. Hugh's Boat Club at any level of commitment or ability, then please get in touch! We're always on the look out for new members! Guy is a first year PPEist and started rowing for SHBC during his first term. He now rows for M1 and holds down the position of treasuring, checking all the books and making sure that people pay their subs on time. I'm Julia, SHBC's resident Gerwegian and social networker/secretary/webmaster. When I'm not on the water, I usually spend my time digging up old stuff, so I'm quite happy to swap one element for the other. I took up rowing when I moved here last term, and I am completely guilty of having fallen in love with it, despite the early mornings, sore hands, bruises and lycra. 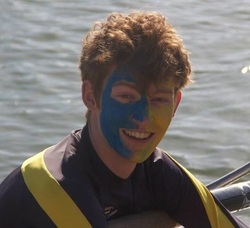 Another new member of the boat club committee is Tom, a first year historian. He currently rows for M2 and would love to hear from you if you fancy a crewdate with Hughs. He also organises all boat club events such as Torpids Roast and Summer VIIIs dinner. 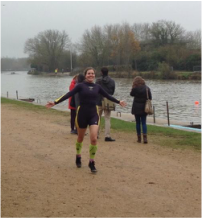 Steph joined SHBC in Michaelmas 2014 and has already had a prestigious start to her rowing career, winning blades with W2 in Hilary 2015. She assists Tom with the organisation of social events, in particular crewdates for the Hugh's women.